Do you read? If you answered yes, congratulations! Please skip this paragraph. If you answered no… shame on you. Reading is a very important facet of the human condition, in my opinion. Through reading, you can not only be entertained but you can also learn new information, broaden your vocabulary, and gain new perspectives. My favorite currently running book series right now has to be The Dresden Files by Jim Butcher. 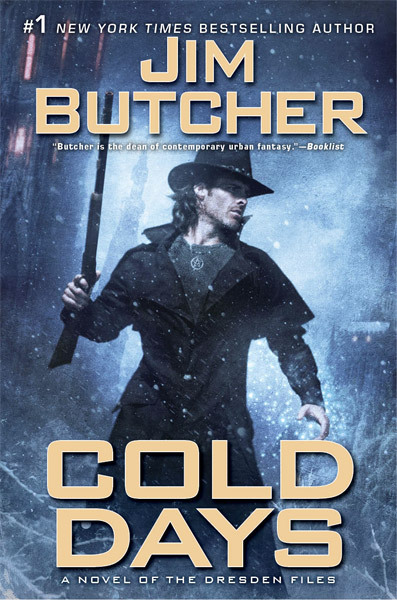 Cold Days, the latest novel in The Dresden Files. No, Harry Dresden does not wear a hat. Yes, he does use a gun (sometimes). The Dresden Files consists of the case files of Harry Dresden, a private eye wizard in chicago. In this world, most wizards try to keep out of the public eye. Harry Dresden, the protagonist, is often short on money so must have himself in the yellow pages. He can find lost items and people, but refuses to make love potions. The one time he does, it ends… interestingly. The series starts with Storm Front, which does an amazing job at revealing Harry Dresden’s motives and intents without dropping too much character content. As the series progresses, Jim Butcher does a fantastic job at introducing new characters and new facets of the lore without bogging down the action. Harry Dresden starts out with tasks that take him to the point of breaking, but (most of the time) he finds a way to prevail. Each new book raises the stakes, so because Harry has been progressing in strength and will Jim Butcher makes it believable that Harry can tackle each new task. In The Dresden Files, not only does Jim Butcher establish well crafted characters and lore but he also has a great skill for the art of writing. Each book will keep the reader on the edge of their seat, wanting to find out how Harry gets out of the trouble he is currently in. One thing that makes the stories even more compelling is that Jim Butcher has no reluctance to beat Dresden to a pulp, hurt him physically and psychologically, and to make things seem beyond hope. The reader can be pretty sure that in the end Harry will win, but often the situations become so bleak that the reader will become unsure. Without spoiling too much, later into the series Harry does not always come out completely on top. If you take my advice and take up reading this series, try to keep going through the first ten books. I know to most people ten books can be daunting, but through the first ten books Jim Butcher establishes the lore, develops the cast of characters, and makes Harry Dresden a protagonist that the reader can truly root for. Harry Dresden, while being the “good guy” often is not purely in the light. He knows which side is good, and he knows to fight against the evil, but Harry Dresden often has his own motives that he has that he realizes only he can achieve. This creates a character that is on the lighter side of grey; he doesn’t quite have enough faith to put himself fully in the light. I appreciate this, because often in life it seems impossible to be completely “good.” This makes the reader root for Harry even more. The Dresden Files can be enjoyed in both dead tree format and audiobook. The audiobooks are narrated by the luscious voice of John Martser, so the audiobooks are just as enjoyable as reading the books. I really hope that if you haven’t had the chance to read The Dresden Files that you will have a chance to do so. I’ve purposely tried to make this article spoiler free because these stories are some of the most enjoyable I’ve ever read. I highly recommend this series. 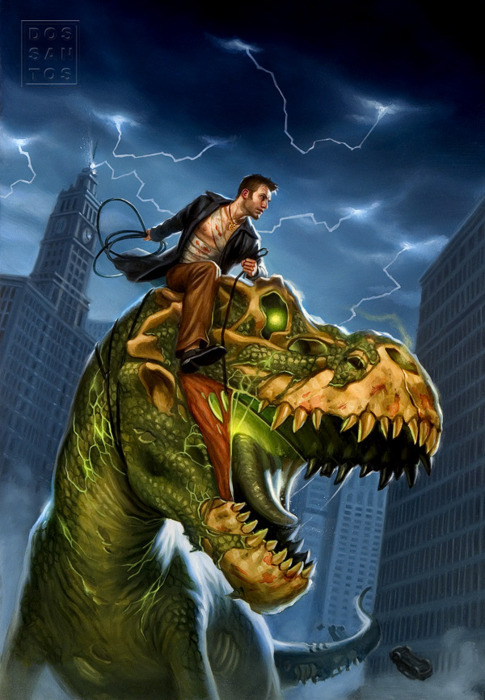 If you need anymore incentive, let me just say that there’s a time when Harry rides a zombie T-Rex.